Bathed in a creamy sauce with fennel and garlic, steamed mussels make a quick summer supper. Serve with crusty bread for soaking up the juices. Scrub the mussels well in cold water, removing any beards. Discard any damaged shells or open shells that do not close when tapped sharply with a knife. Drain in a colander. Melt the butter in a large, heavy-based saucepan with a tight-fitting lid. Add the fennel and sauté gently, uncovered, for about 5 minutes until lightly browned. Stir in the garlic and fry for 1 minute. Pour in the wine and bring to the boil. Tip the mussels into the pan and cover. Cook for about 3-5 minutes, shaking the pan a couple of times until all the shells are open (discard any that remain closed). 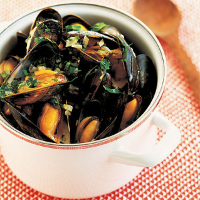 Using a large slotted spoon, remove the mussels and divide between 2 bowls. Cover and keep warm. Add the crème fraîche and a little pepper to the pan and return to the boil. Stir in the parsley and boil rapidly for 4-5 minutes to reduce the liquid slightly. Pour over the mussels and serve immediately, with warm, crusty bread to mop up the juices. Until you are ready to cook, remove the mussels from the plastic bag and store in the fridge in the net in which they are sold. The quantities above are designed for a main course, but with warmed bread would serve four as a starter.